Broadband detectors like the REI CPM-700 can be used to physically sweep a room to locate the source of a radio frequency (RF) transmission. One of the benefits of a broadband detector is the displayed response to a nearby transmitter is almost instantaneous. When the antenna comes within range of a transmitter, an immediate response is displayed if it is the strongest signal present. Broadband refers to the wide frequency range or spectrum within which the broadband detector is able to detect signals. The broadband detector will see any RF energy, regardless of the signal type (broadband vs. narrowband, modulated, etc.). Broadband detectors commonly display the highest RF level in the area as a bar graph or spectral graph. As the receiver antenna gets closer to a transmitter the signal increases, and decreases as it moves away. To find the location of a hidden surveillance transmitter, find the area of the room that produces the highest level on the bar graph. A “walk around sweep” will locate the area of a room that is “HOT” with RF energy. The detection range depends on several factors; the transmit power, antenna efficiency, and signal pattern. The volume of surrounding RF energy is also a key factor, such as commercial radio/TV/cell phone and two-way radio transmissions. In large cities and areas of high concentrations of RF activity, the receiver can become over saturated. If the receiver has adjustable gain settings, it may be necessary to adjust gain or attenuation. Audio and video devices can transmit information using RF energy to a listening post. They may also send information along ordinary power lines, phone lines, or building wiring. 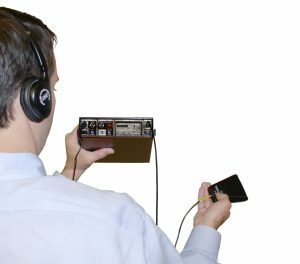 Information may be analog (modulated onto the signal) or digital (encoded into a series of 1’s and 0’s that will be de-coded at the listening post). Utilizing various probes in addition to a broadband receiver can assist in detecting these types of transmitters. A broadband detector is a physical search tool and vital to the foundation of countermeasures work. Any sweep must include a complete physical search of the target area and will usually require many tools and methods to perform thorough investigations. The REI Training Center Countermeasures Core Level 1 course teaches the use of the CPM-700 and other products for investigating illicit information theft. Please note that the CPM-700 has been discontinued. To view REI’s newest broadband detector, visit the ANDRE Advanced Near-field Detection Receiver page.